You are here: Home / Blog / Business IT Guides / Windows Server 2012 Is Great But Should You Upgrade? As a business owner, you should always be on the lookout for tools and methods of keeping your business data safe and, at the same time, easily accessible. 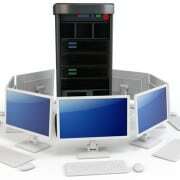 You want an easy to use, secure and powerful server management, and you want to it to be very reliable. 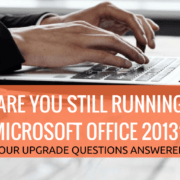 You know just how important it is to get the most out of your time, and using the help of Windows Server 2012, you can cut out a lot of the time that you would normally be spending with server management. Let’s talk a bit more about Windows Server 2012, and find out if it’s the best option for you. 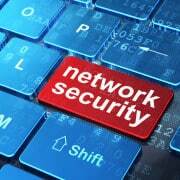 One of the most important features of Windows Server 2012 is the very powerful data protection and cloud integration. 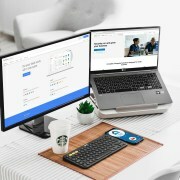 Using the remote web access feature you can easily access your data from any device that has an Internet connection as well as a browser. 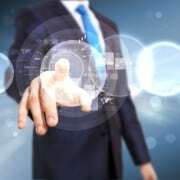 You can greatly increase the productivity of your business operations by utilizing the benefits of cloud-based messaging and collaboration services. Windows Server 2012 also features a status monitor that automatically monitors the health status of its own computer as well as all computers on the network. Standard Edition and up has Hyper-V, Microsoft’s own virtualization platform. 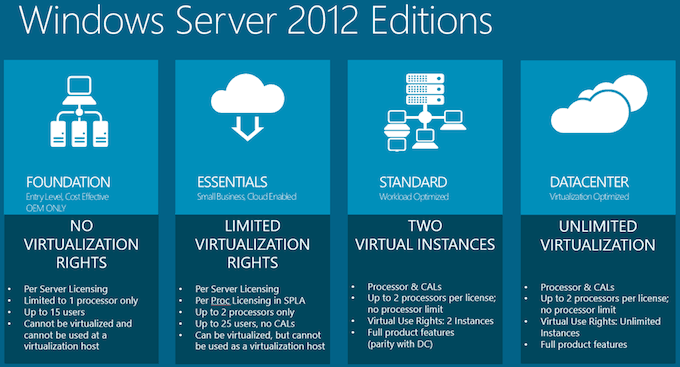 Windows Server 2012 comes with four different editions that each has their own price and features. You should firstly determine which features that you will need before you decide which edition to go with. Let’s talk a bit more about the different editions and their prices. This version is the most costly of the four and it features the unique function of unlimited virtual instances. This edition would be ideal for highly virtualized private and hybrid cloud environments. This will have all of the features of Datacenter, but with only two virtual instances able to be run. This would be best suited for low-density environments. This has a much simpler interface that is pre-configured for cloud connectivity. 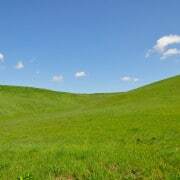 With this version you will not have access to virtualization rights. Essentials Edition is ideal for small business environments. This edition features minimal features and offers no virtualization rights. Users who want a general-purpose server would find this to be best suited. 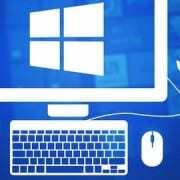 You can certainly save your business from spending countless hours on server management by utilizing the features of Windows Server 2012. It’s recommended that you take the time to analyze your business’ needs in order to determine which edition is best suited for your workflow. https://ifeeltech.com/wp-content/uploads/2013/04/server2012small.png 367 680 Nandor Katai https://ifeeltech.com/wp-content/uploads/2013/04/iFeeltech-Logo-Enfold.png Nandor Katai2013-04-23 13:13:532013-12-05 21:30:40Windows Server 2012 Is Great But Should You Upgrade? 10 Productivity Apps we can’t live without. How to Stay Safe on Public Wifi.